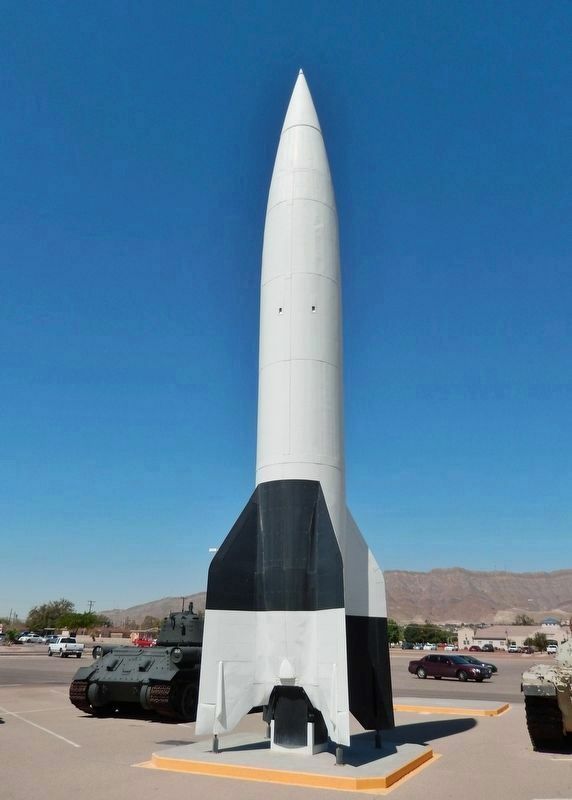 Developed in Germany, the V-2 was the first liquid fueled rocket to see combat. Approximately 3,170 launches were made between September 1944 – March 1945 targeting Belgium, London and Paris. 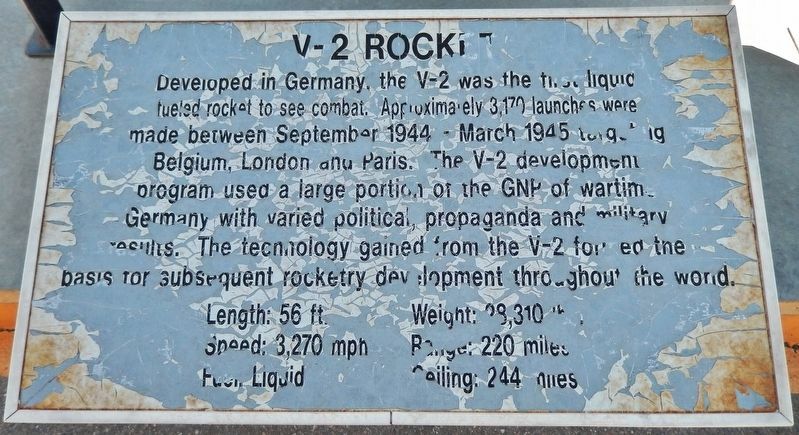 The V-2 development program used a large portion of the GNP of wartime Germany with varied political, propaganda and military results. The technology gained from the V-2 formed the basis for subsequent rocketry development throughout the world. access through the Fort Bliss main gate. Marker is at or near this postal address: 1735 Marshall Road, El Paso TX 79906, United States of America. Touch for directions. Other nearby markers. At least 8 other markers are within walking distance of this marker. AH-1F COBRA Attack Helicopter (a few steps from this marker); "General of the Army Omar N. Bradley Flagpole" (about 300 feet away, measured in a direct line); Mexican War Refugee Camp (about 300 feet away); Pearl Harbor Memorial (approx. 0.4 miles away); Building 1372 (approx. half a mile away); Building 1355 (approx. half a mile away); Second Expansion Period Group (approx. 0.6 miles away); Historical Building 241 - The Guardhouse, 1893 (approx. 0.9 miles away). 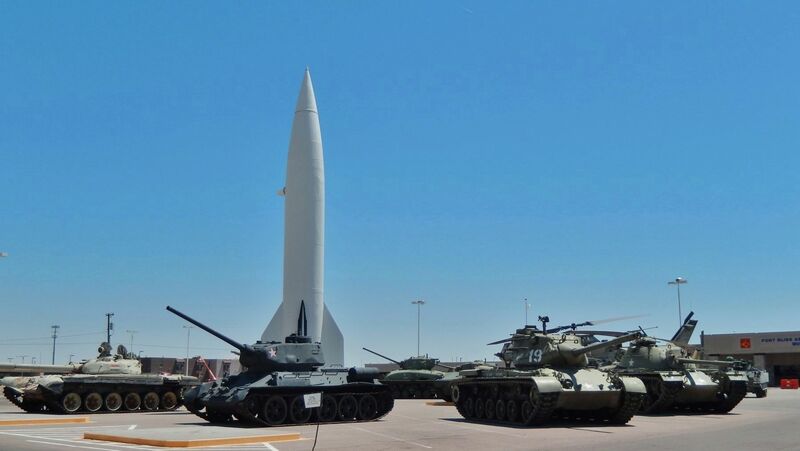 Touch for a list and map of all markers in Fort Bliss. More about this marker. Marker is a painted and weathered metal plaque, mounted horizontally on a waist-high post, on the west side of the V2 Rocket exhibit. More. Search the internet for V2 Rocket. Credits. This page was last revised on March 1, 2019. This page originally submitted on March 1, 2019, by Cosmos Mariner of Cape Canaveral, Florida. This page has been viewed 59 times since then. Photos: 1, 2, 3. submitted on March 1, 2019, by Cosmos Mariner of Cape Canaveral, Florida. • Bernard Fisher was the editor who published this page.